RCA's Roku TVs have officially launched and are available through Walmart.com and Amazon.com, as well as select retail stores. This line of LED-based LCD TVs includes three models: the 50-inch and 43-inch models have a 1080p HD resolution, while the 32-incher has a 768p resolution. The built-in Roku OS allows users to access all the smart TV services and features available through Roku's platform. Technicolor owns the RCA brand, and RCA TVs are manufactured by Display-Vu. Prices range from $249.99 to $499. 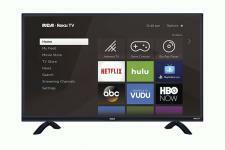 RCA has announced its new line of smart TVs running the Roku OS are available today. The RCA Roku TVs are available online and in-store in the U.S. Prices begin at $249.99. The line includes a 50" HD model (1920 x 1080) for $499 MSRP, 43" HD model (1920 x 1080) for $379.99 MSRP and 32" model (1366 x 768) for $249.99 MSRP. The new RCA Roku TVs leverage the Roku TV platform to provide RCA customers with an easy-to-use smart TV interface, which features favorite streaming channels alongside other entertainment options like cable boxes, gaming consoles, antennas and other devices. In the U.S. customers have quick access to more than 5,000 channels and 500,000 movies and TV episodes, as well as fast and easy Roku search, which offers an unbiased look across 300+ streaming channels to find movies and TV shows with results ranked by price. The new line is on sale at Walmart.com and Amazon.com today. The TVs are also available for purchase in-store at BJ's and Brand Smart, as well as at ABC Appliances, Bi Mart, Cowboy Maloney, Evine and Shopko. "We are excited to make our mark once again on the TV landscape," said Claire Villeneuve, head of trademark licensing for Technicolor, which owns the RCA Brand. "TV viewing habits are changing and streaming is becoming the norm. RCA's partnership with Roku allows us to offer our customers a fantastic, yet affordable smart TV with amazing content choices, on one of the most robust smart TV platforms available." "By aligning with Roku, we're offering consumers the affordable innovation they've come to expect from the RCA brand, and we see this partnership as helping RCA to once again make an impact in the U.S. TV marketplace," said Aaron Herzog, President of Display-Vu, an affiliate of Curtis International Ltd., which manufactures the RCA brand TVs. RCA Roku TVs include a TV tuner input to receive over-the-air TV channels and feature the ability to create a Favorites Channel list. The Live TV Pause feature even allows consumers to conveniently pause live broadcasts. The RCA Roku TV comes with an easy-to-use remote featuring channel shortcut buttons to get to content quickly. The free Roku mobile app turns iOS or Android mobile devices into a streaming companion and features remote functionality, voice search, private listening, a keyboard, the ability to share videos, music and photos to the TV and an easy way to find What's On via a hand-picked selection of movies and TV shows available to rent, buy or watch for free. "At Roku, we pride ourselves on our simple UI, providing a vast content library and easy ways for TV lovers to find and discover entertainment," said Chas Smith, general manager of Roku TV & players. "RCA has been associated with American innovation for almost a century and we believe consumers will enjoy the RCA Roku TV experience." • Roku TV Platform Coming to RCA-Branded TVs at HomeTheaterReview.com. • Visit the RCA website for more product information.